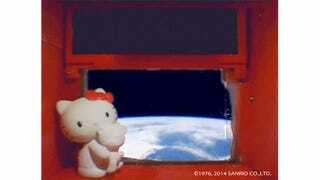 Hello Kitty Has Been Launched into Space. Literally. One of Japan's most famous cute characters is now orbiting the Earth. That's right, Hello Kitty has been shot into space. According to Reuters, a 1.6 inch tall Hello Kitty is on the Hodoyoshi-3 satellite. The Hello Kitty figure is next to a window overlooking our spinning blue planet. Above the window is an electronic message board, and Hello Kitty fans can send in short messages that might be broadcasted on the board. The satellite is the size of a large trashcan, Reuters reports, and is part of a $40 million government-funded program aimed at attracting private companies to space satellites. While this might seem like it's just a little Hello Kitty figure in a satellite, researchers spent the past few months ensuring that while the satellite was in orbit, the Earth would continue to serve as a backdrop for Hello Kitty. A special coating was needed for the Kitty-chan figure so it could withstand the elements in space. If you are interested in sending a message to Hello Kitty in space, you can find out more in the link below. Oh, and this year marks Hello Kitty's 40th anniversary, so maybe wish the cat a happy birthday?